The Rose Kennedy Greenway is a mile-and-a-half linear series of contemporary parks in the heart of Boston. Created from the remains of an elevated highway, the Rose Kennedy Greenway provides the city of Boston with both beauty and fun. As the Central Artery project, or the “Big Dig” neared completion and the highway was relocated underground, community leaders realized that the old, elevated highway could be repurposed to enhance Boston. 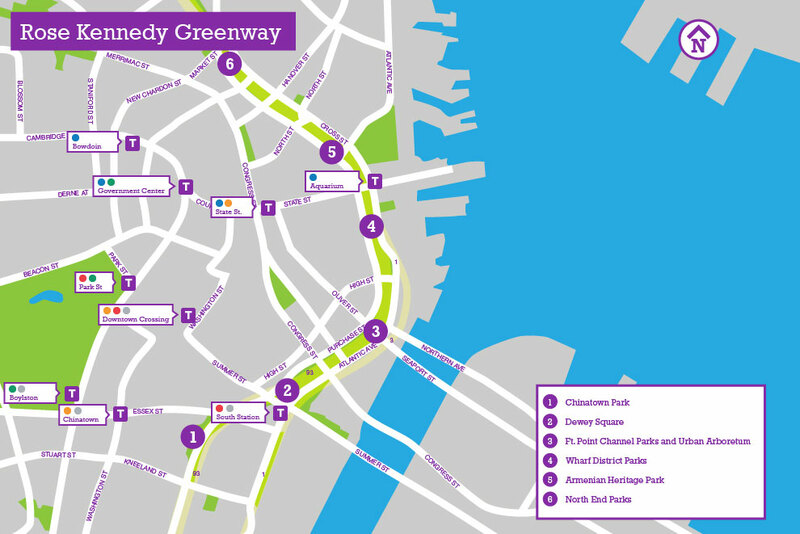 The Rose Fitzgerald Kennedy Greenway is located between New Sudbury Street in the North End and Beach Street in Chinatown. It is broken up into six different and unique parks. The parks are open from 7AM to 11PM every day. The entire Greenway has free Wi-Fi. For pedestrian safety, biking, skating, skateboarding and Segways are not permitted in the park. 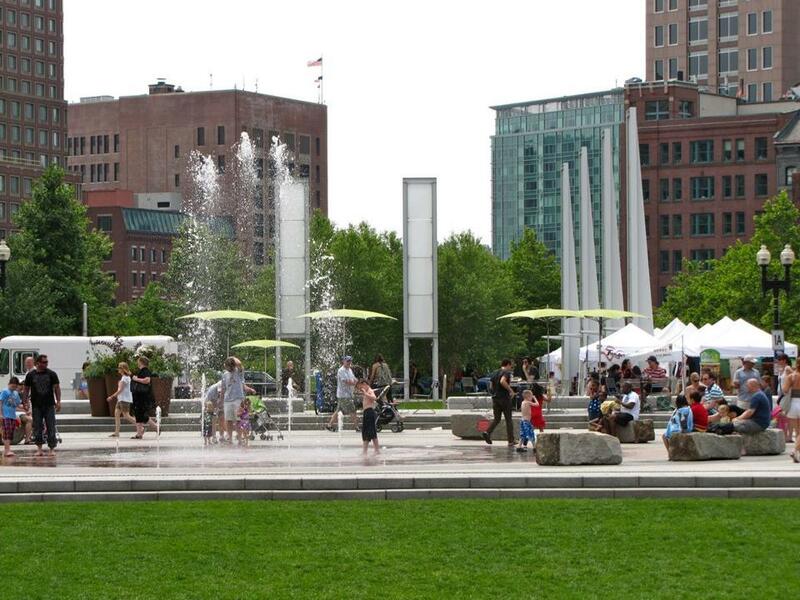 While the parks are fun to explore, The Rose Kennedy Greenway Conservancy partners with several different Boston organizations and companies to host events throughout the year, especially during the summertime. Below we have listed some of our favorites. Greenway Mobile Eats – April 1, 2015 marks the sixth season of Greenway Mobile Eats with 30 participating food trucks. The rotating selection of food vendors are located at six different vending locations seven days a week. The daily schedule and specific locations can be found on the Conservancy’s website. Coolidge at the Greenway – The Rose Kennedy Greenway Conservancy and the Coolidge Corner Theater have partnered to present a free outdoor screening series this summer. Some upcoming screenings include Alfred Hitchcock’s masterpiece The Birds on July 14 (rain date July 21) and E.T. : The Extra-Terrestrial on August 4 (rain date August 11.) Screenings are held at sunset at The Greenway’s Wharf District Parks, located between Milk and India Streets. Here is the full schedule. Farmer’s Markets – The Farmers’ Markets operate at Dewey Square Park Tuesdays and Thursdays beginning May 19 through Thanksgiving week. In addition, they are held by the North End portion of the Greenway on Wednesday and Sundays. Greenway Open Market – The Greenway Open Market is an artisan market operated by New Open Markets. The Greenway Open Market is held on Saturdays from May 2 to October 10, 2015. The Conservancy supplies food trucks for each market. It’s a vibrant way to support local artists, shop for unique items and eat some delicious, reasonably priced food. Berklee Greenway Concert Series – This popular series is held on Wednesday evenings from 5-7PM from June 17th through August 19th (except July 1.) A talented roster of Berklee students perform under the Echleman Sculpture by the Fort Point Channel Parks. Boston Calling Block Parties – These extremely popular concerts are held weekly. Spotlighting local bands and artists, these concerts are becoming a Boston favorite. They are held in Dewey Square Park on Thursdays from 5-8 beginning in May. After all the excitement on the Greenway, make your way back to the Clarendon Square Bed & Breakfast for a relaxing glass of wine on our roof deck, take a dip in the hot tub, or lounge on the back deck.